Carl Wilhelm Trenckner. [From the introduction to the CPED]: He was born in Copenhagen and grew up in the same milieu as Westergaard and Fausbøll. His father, who was of German descent, was a baker by trade; his full name was Carl Wilhelm Trenckner, but he himself used always to write it V. Trenckner. Having passed through a German middle-school in Copenhagen he received private instruction and matriculated at the university (1841), where he first turned to the study of classical philology (esp. the lectures of Prof. Madvig), but at the same time applied himself to the study of Persian, Arabic, Syriac, Aethiopic and other Oriental languages, not to speak of modern European languages (as German, English, French, Spanish, Italian and Russian), in which he preserved a vivid interest all his life. The great results of the famous journeys of Rask and Westergaard in Persia and India by and by drew his main interest towards the East, and so he never acquired any university degree in classical philology. A moderate fortune enabled him to indulge in linguistic studies at his ease during his youth. As may be seen from his written papers he was especially proficient in Arabic and Persian and for that reason he hoped (in 1853) to obtain a post at the Royal Library, but failed in spite of the most flattering recommendations from his Orientalist professors. 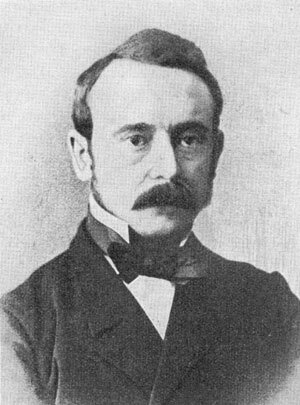 At last (in 1861) he found a modest post in the Copenhagen Orphans' Asylum, where until his death (1891) he instructed the poor children in Danish and the elements of History and Geography, and accidentally some more advanced pupils in modern languages, in which he was altogether perfect.